With pecan harvest already started on Pawnee, pecan growers will soon be in the heat of the battle to get the crop harvested and sold. Dr Lenny Wells, UGA Extension Horticulturist, gives this report. ” I wanted to offer this overview of how the crop looks to this point and our current market situation. This does appear to be the best crop we’ve had in 2 to 3 years, with an anticipated 110-120 million lbs. The wet spring weather gave way to a dry June, which really helped save most growers from scab. There are still some pockets of scab in the state, mostly in the Albany area and over into Southeast Georgia on highly scab susceptible varieties, but growers did a pretty good job of keeping the nuts clean this year. Insect problems were light until August and September but aphids and mites came on with a vengeance at that time. Most growers sprayed multiple times for both pests late in the season. The crop appears to be at least 10 days to 2 weeks early. We are seeing shuck split beginning on most of the mid-season varieties at this time. We are probably about 2-3 weeks away from harvest really getting under way on our main varieties, at least in the western portion of the state. Growers east of I-75 have historically started a little later. Nut size is much better than we saw last year and most of the nuts I have cut into or cracked open have been well filled. I’ve been hearing of a lot of pops in the Pawnees that have been harvested. 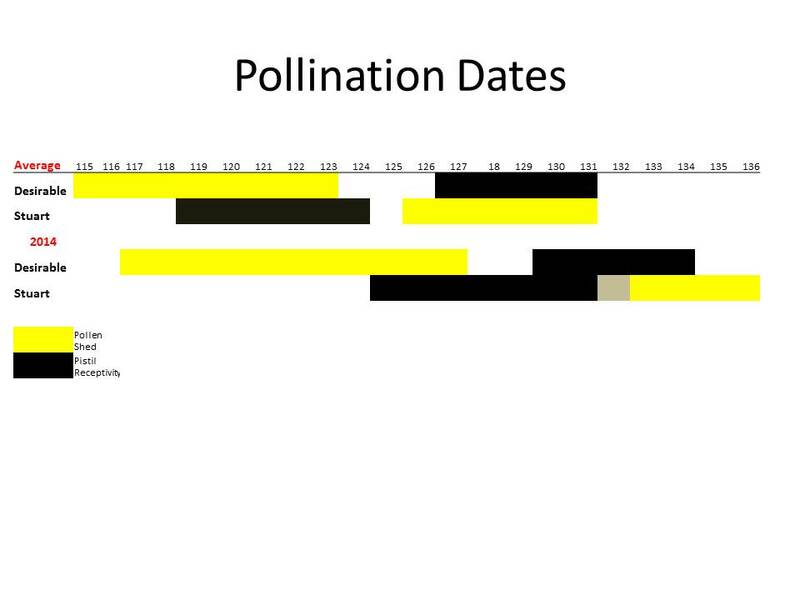 While this is not an unusual characteristic for this variety, I am hopeful that we do not find a high percentage of pops in all varieties, which would indicate a pollination issue. 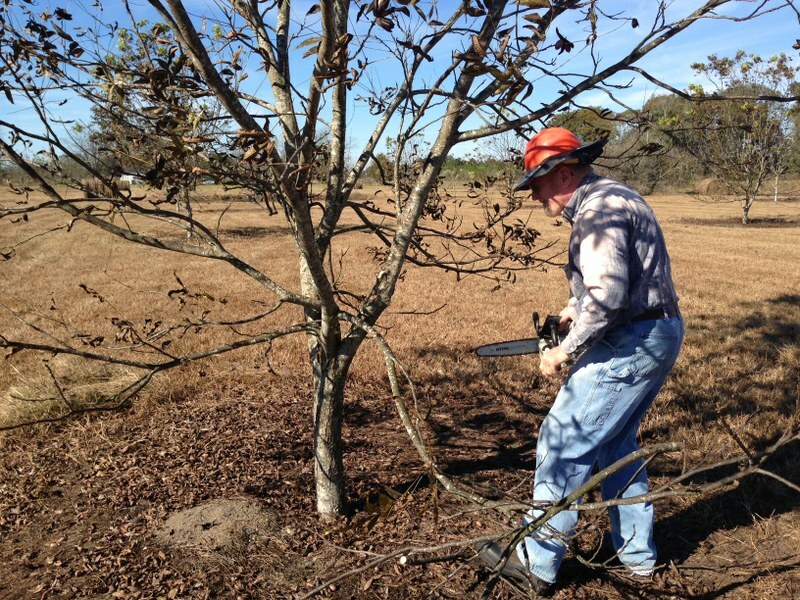 Eric Cohen of R, R and E Pecans, is harvesting pecans this week here in Seminole County. 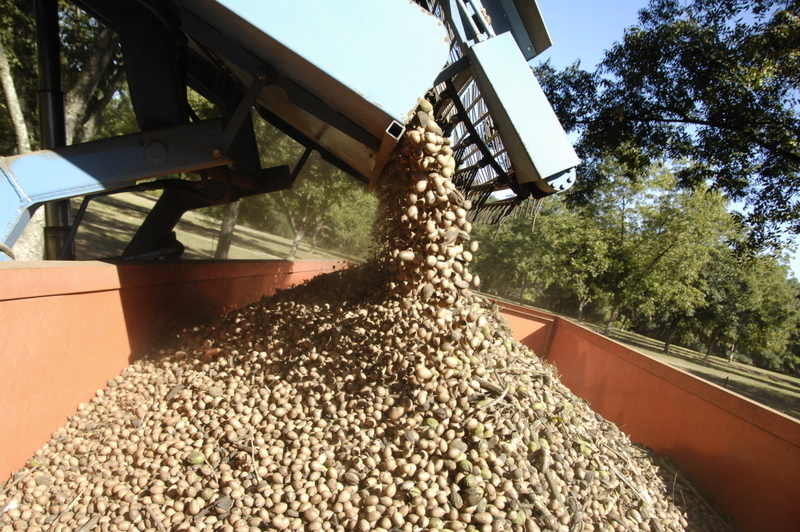 Their headquarters is in nearby Brinson, Georgia where they have cleaning and high tech sorting equipment for nuts coming from the thousand or so acres of trees that they work. 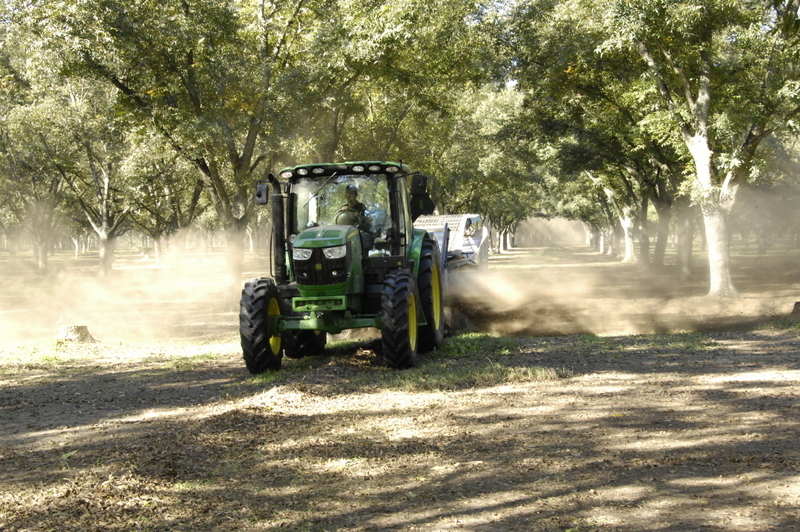 I was amazed at the efficiency and speed of the pecan harvester in the orchard. 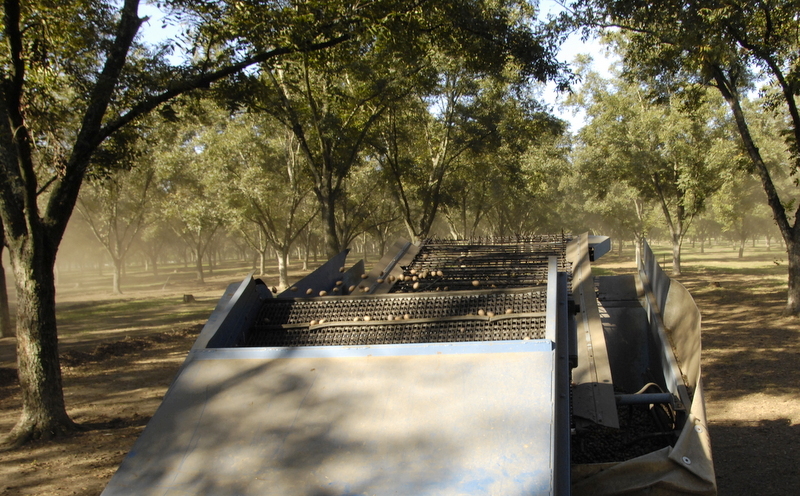 The harvester holds 3500 pounds of nuts and when full, he stops and dumps the nuts into a wagon hydraulically. 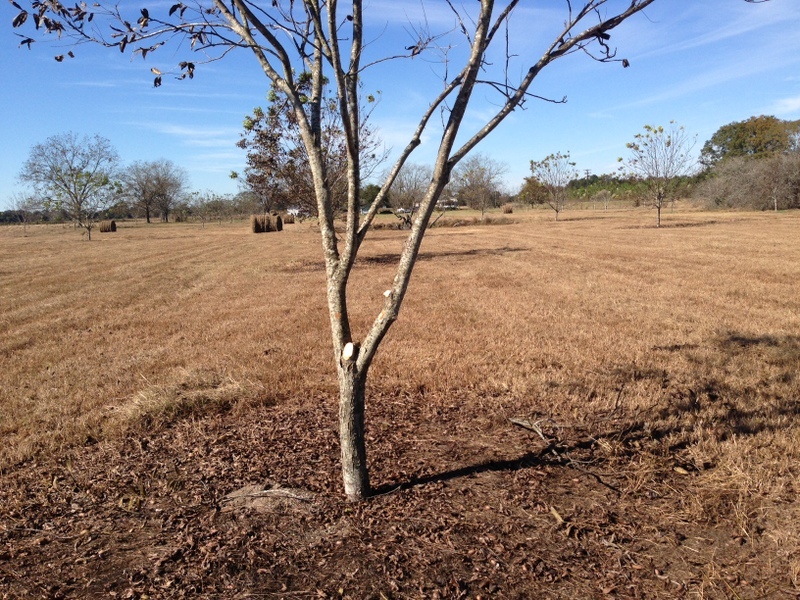 This was just the first of about 3 passes that will be made, over time, to harvest the pecans as they fall from the trees. Eric says that the yield seems about 20 % off this year and the prices are lower as well but still ok, mainly due to the increased export demand of pecans over the past few years. Harvest is early this year and is going quickly, as we are about 70% done here. 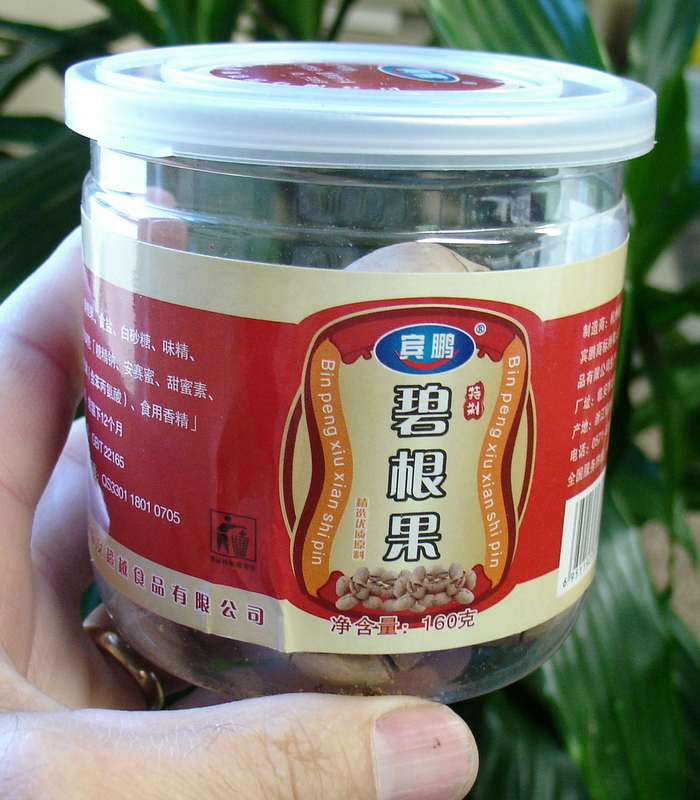 Pecan demand in the US is pretty constant but the Chinese have really been enjoying this tree nut in recent history. The Cohens have done a good job of seeking out markets and now send about 90% of their pecans to China. 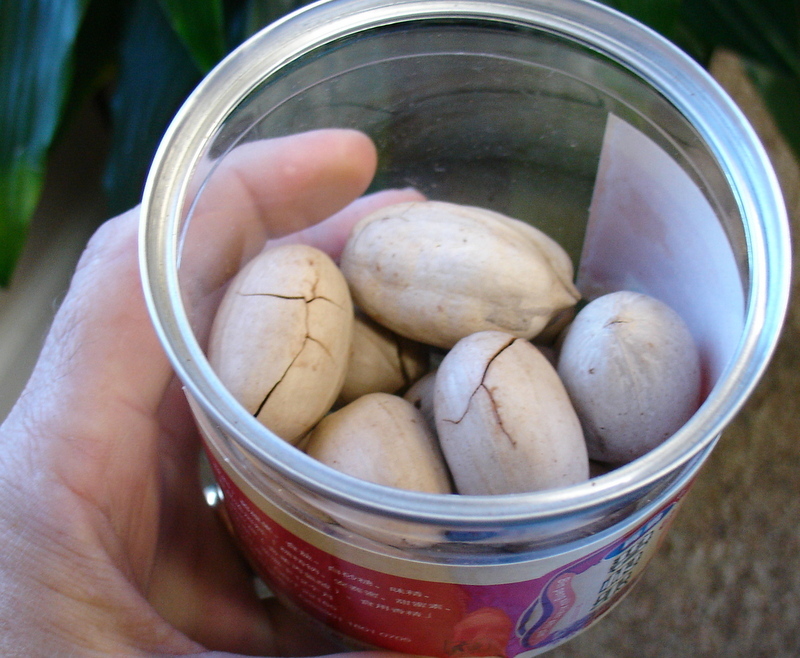 Eric says the Chinese prefer the larger nuts and they size them to keep their customers happy there. Eric brought me an example of how the Chinese market pecans in their country. There wasn’t any English on the container at all but their was a little phonetic lettering , so I googled a translation and this is what it was: “Friends and Guests Snack Food”. 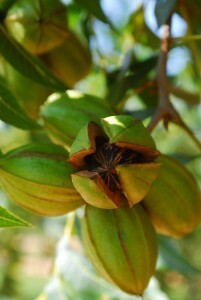 They treasure the pecan and so that helps us with agricultural exports. This year UGA’s Ag Forecast meetings will be looking at Ag Exporting so here’s a link to the site so you can find out more about these events across Georgia. http://georgiaagforecast.com/ We will have one of the events in Bainbridge this year. 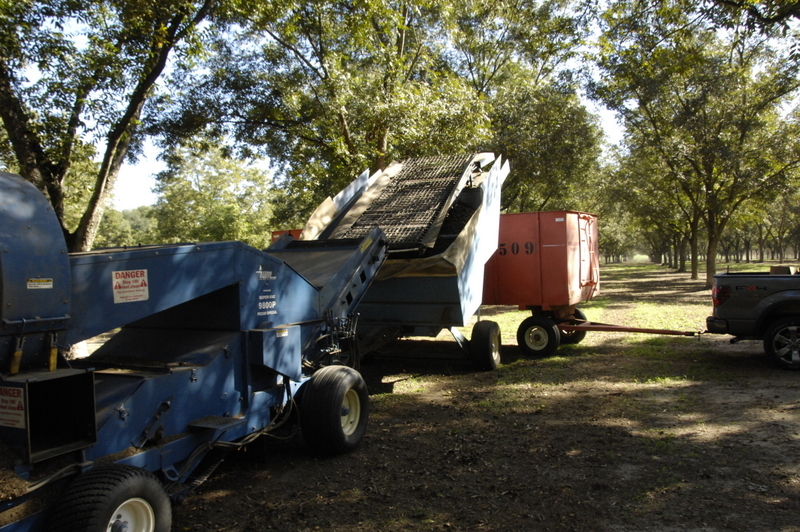 Here are some pecan harvest photos and Chinese product photos. Here is a link to a video I took of the harvest. 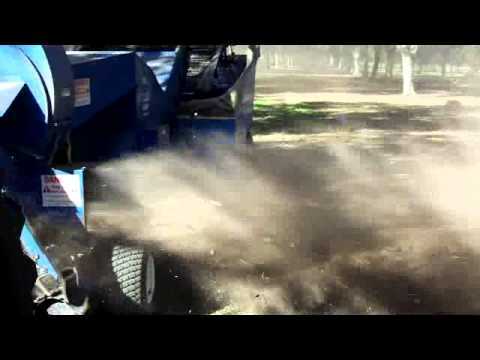 Here comes the harvester after the nuts have been raked to the center. 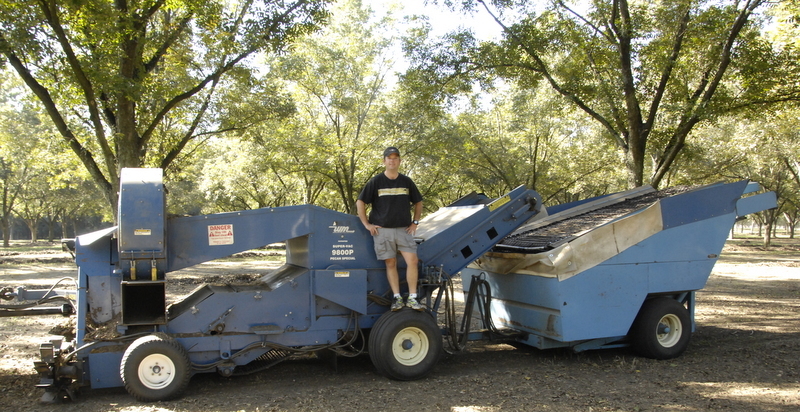 Eric Cohen with the machine that gets the nuts off the ground. Getting ready to dump pecans into the trailer.